This is an amazing inspirational travel quote by Ray Bradbury that I love the most. It is to say that the more you travel the more experience you gain. Travel to delve into exotic things will help you become more mature. As a frequent traveler who has a passion for exploring the distinctiveness and uniqueness of regional cultures and festivals, especially Vietnamese festivals, I found that Vietnamese festival culture is so fascinating that every aspect of its festival culture made a deep impression on me. For a long time, Vietnamese festivals have been closely attached with traditional habits including praying, worshiping and showing respect for ancestors and also become an integral part of Vietnamese people’s spiritual life. It’s interesting to discover one of those to have a deeper understanding of Vietnamese culture and you can benefit some useful knowledge from it. Here, I’m going to share with you a list of unique festivals in Vietnam that I myself experienced and hope that you can benefit a few from it. During my second travel to explore the Central Highland of Vietnam, I also spent 1 day attending another outstanding event known as Elephant Racing Festival. It’s also another no less interesting festival in Vietnam that I experienced. As we all know, elephant is a precious animal which not only helps local people a lot in transporting, traveling and working but also represents loyalty under the feudal government. For that reason, Elephant Racing Festival appeared and played an important part in local people’ life. 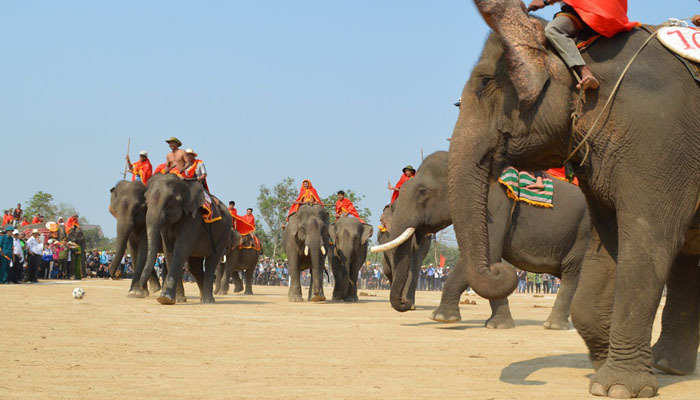 Held in the third lunar month every year, Elephant Racing Festival heavily weighs in the conscious of locals as a festival to express the harmony between human beings and super nature. When attending the festival, I was taken aback by the appearance of a great number of elephants from nearby villages gathering to prepare for the festival. Then, the competition started under the guide of a sound from tu va – made from horn. Also, there are other games such as swimming competition and gongs and drums performance. All created a lively festival that not everyone could forget. 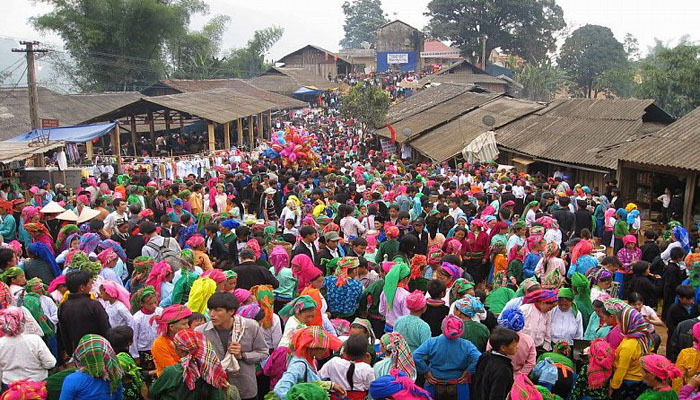 Another amazing festival that I want to share with you is Khau Vai Love Market Festival in Khau Vai Commune, Meo Vac District, Ha Giang, a northern province of Vietnam. For sure, everyone attending this event would be amazed by its unique traditions as well as exciting activities that the festival offers. Perhaps, you may be curious about the name of the festival which originates from a sad story about a couple who fell deeply in love with each other but then were forbidden because of their ethnic difference. 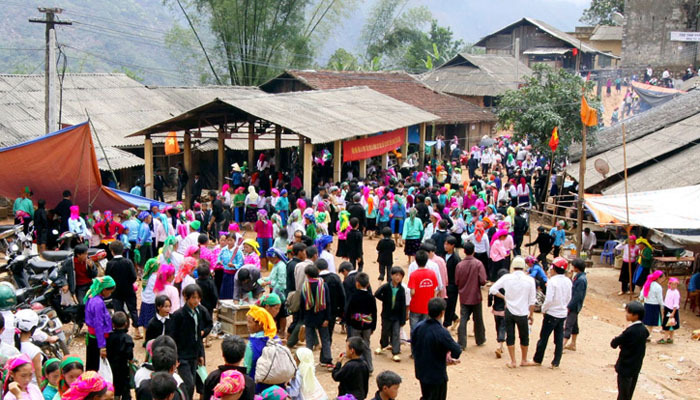 From then, Khau Vai Love Market Festival appeared and became a meaning activity of people in the northern of Vietnam. There are a great number of highlights during the event. I had a chance to witness such interesting competitions as horse races, traditional dish exhibitions, and incense offerings. All activities are purposefully organized to preserve the beauty of long-established culture and ethnic identity. If I had another chance, I would definitely come back to participate in the festival someday. One more incredibly astonishing festival in Vietnam that I had a chance to join is Buffalo Sacrifice Festival. At first, I was impressed by the name of the festival and thought that it was a really weird one. But then, when I could know its meaning of the festival’s existence, I felt lucky having an opportunity to witness it. 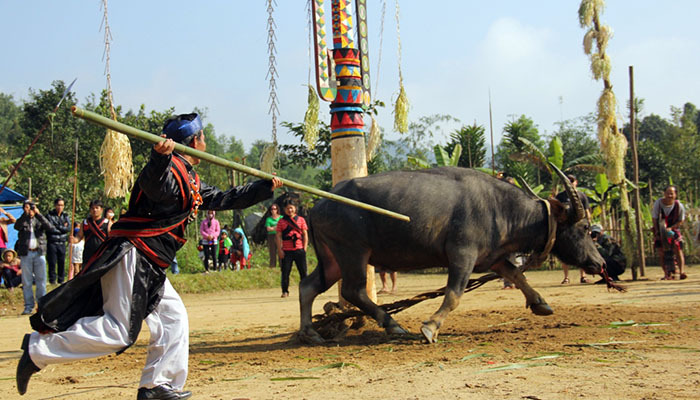 Characterized as an annual festival in the Central Highland of Vietnam held by ethnic minority community in 12th -3rd of the lunar month, Buffalo Sacrifice Festival has existed for a long time as a cultural activity to wish for prosper, wealth and happy life. On that day, local people prepare everything carefully, wear colorful skirts and play traditional music devices including Gongs and drums. The hustling and bustling atmosphere of the whole festival enables visitors want to join the exciting activities. Among wonderful things, I particularly enjoyed the dancing game performance between male and female in the village in which female participants and the male ones tried to splash water to each other to get rid of unlucky things. Thanks to Buffalo Sacrifice Festival, I learned a lot about the cultural beauty of ethnic minority and also experienced a variety of entertaining activities that I cannot find in other regions. For sure, those who are planning a trip to Vietnam should take time to take part in this featured festival to get the taste of a lovely Vietnam. 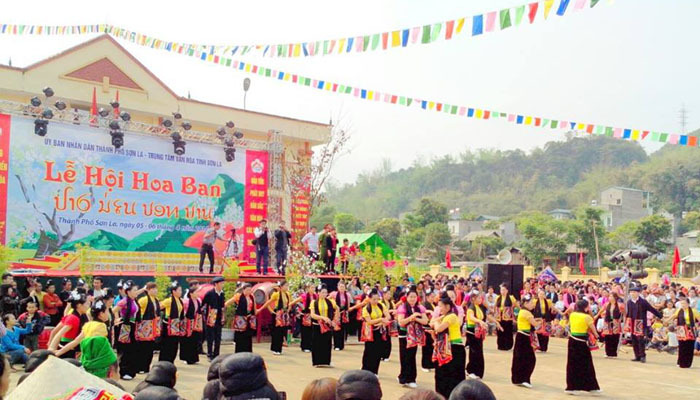 For those who have an eternal love for colorful flowers, welcome to Ban flower Festival in Dien Bien where you can admire a new outfit of Vietnam’s forests. 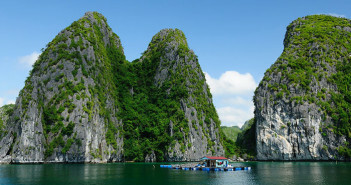 Vietnam’s natural beauty has never stopped surprising visitors to this lovely S-shaped land. The diversity of natural resources favored by ideal natural conditions and abundant flora and fauna system contributes to contributing to the country’s multicolor picture. At the beginning of the New Year, the cheerful melody of lively flock of swallows signals the beginning of spring, Ban flowers put on itself the most newly garish beauty that others can hardly catch up with it. What is more, you will be overwhelmed by fragrant rows of colorful flowers as well as rays of sunshine and light breezes. All create a sparkling picture with the contact of tastes, sounds and smells. The festival is an occasion for Thai ethnic people to meet and date each other. People from nearby villages gather together and exchange great melodies of the spring. Actually, Ban flower festival is not only the time for Thai people to share their luck and happiness in life but also an opportunity for them to show their respects to ancestors. These above-mentioned festivals are based on my own experiences. 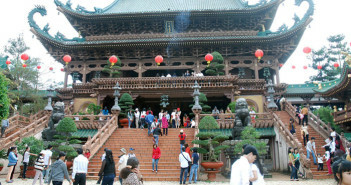 Hope that you can find it helpful and have a good time in Vietnam to enjoy such great cultural experience. If you are familiar with Vietnamese Lunar New Year or Mid-Autumn Festival, Giong Festival is quite new and unique to those who first visit Vietnam. 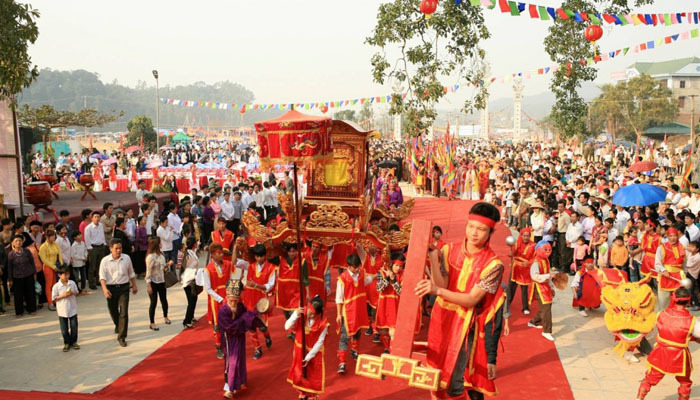 Celebrated in spring time in Phu Dong or Soc Temple to commemorate Saint Giong – a great hero in Vietnam’s mythology who defended the country against enemies, Giong Festival has become a meaningful activity to promote local people’s patriotism. I had such a great time when witnessing old villagers and festival-goers demonstrated processions and incense offerings. Especially, I strong recommend taking part in a wide range of traditional games and activities encompassing folk games and ancient singing performances. Actually, I was totally mesmerized by all the exciting things here and dream participating in this amazing traditional festival one more time.